The blocking of some applications from running in Windows 10 is due to security protection, especially when the application was digitally signed with a revoked or untrusted certificate. The problem happens even when you’re logging in with a user account in Administrators group user group, or run the app as Administrator. If you trust the app or program, you can use one of the following workarounds listed in the tutorial to bypass the Windows 10 Smartscreen filtering to install or run the app. To run an elevated Command Prompt, use of the methods to open an elevated Command Prompt as Administrator. Hit Enter when done. You can close Command Prompt window anytime. Admin Approval Mode restricts the privileges to built-in Administrator account and all other users who are members of the Administrators group, directly contribute to the app is blocked problem. Disabling Admin Approval Mode essentially disable the User Account Control (UAC) completely, significantly heighten the security risk of the operating system. Open the Local Group Policy Editor by searching for gpedit.msc. 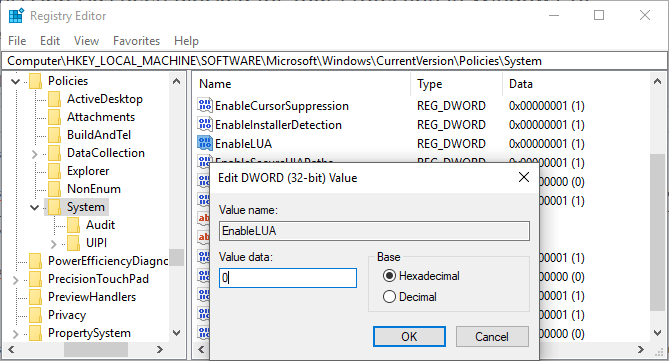 In the left pane of Local Group Policy Editor, navigate to Computer Configuration -> Windows Settings -> Security Settings -> Local Policies -> Security Options. 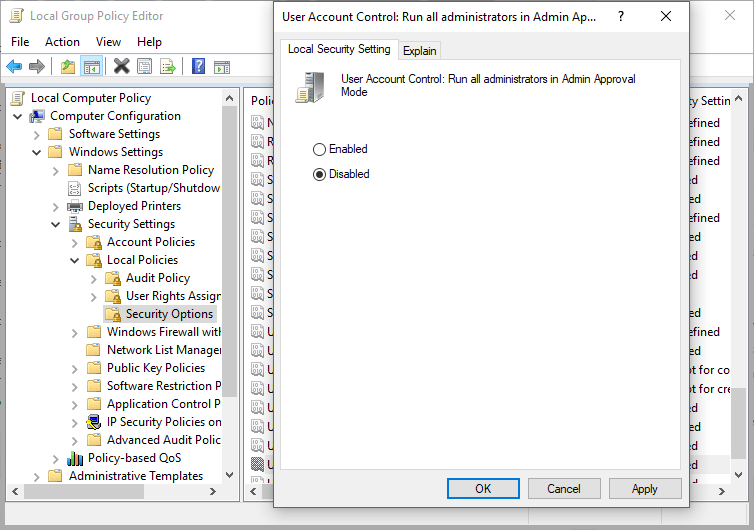 In the right pane, double-click on User Account Control: Run all administrators in Admin Approval Mode. Change the security setting to Disabled. Restart the computer for the change to take effect. If you’re using home edition of Windows 10, you may not have Local Group Policy Editor. However, if you change the registry setting (which is modified by the group policy) directly , as shown in method 3. The registry setting change achieved exactly what’s done by group policy as outlined in method 2. Thus, it disables the User Account Control (UAC) completely, significantly increases the security risk to the operating system. Open Registry Editor by searching for regedit. In the right pane, double click on EnableLUA. Change its value data to 0 (default value is 0). The built-in Administrator account in Windows 10 has less restriction that user accounts in Administrators group, even when UAC is enabled. 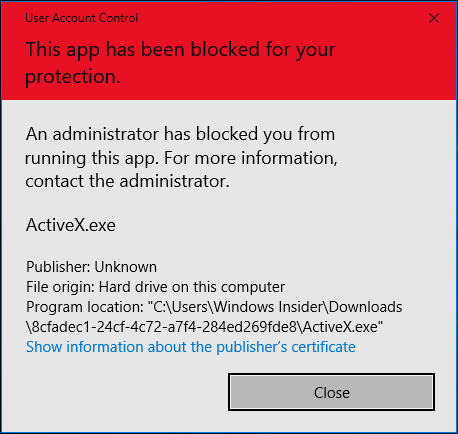 Thus, the “this app has been blocked for your protection” error can be fixed by running the installer or executable in the built-in Administrator account. Before you’re able to sign into built-in Administrator account, you need to enable the built-in Administrator account. Switch user or sign out the current user. Sign in with the Administrator user account. Run or install the blocked app. You can choose to switch user or sign out the Administrator account to sign back in to your user account. Once installed, the application would run without being blocked by UAC SmartScreen. You can now disable the built-in Administrator account.